For this project every student had to create a non fiction writing piece that will all go together in a book created by us. Every student picked a topic that they could relate to and were passionate about, because that is when the best writing is created. After getting all our main ideas and writing points down, lots of editing was done. The point of this project was to take our writing to the next level. I had to read countless mentor texts, research studies and I spent hours of editing. My piece is about the effects of technology on my generation; it was titled 'Technology Can Not Be Stopped'. Before I could start writing my piece I needed examples and prototypes of writing in the real world. Writing inside a classroom is different then writing outside of school. 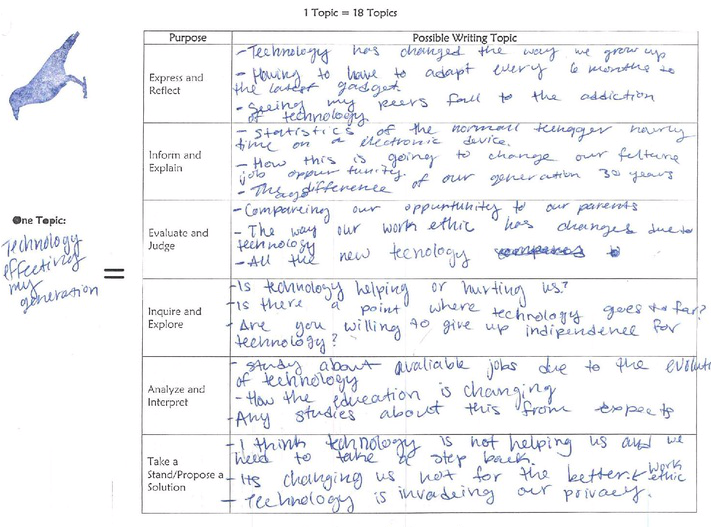 School writing is more formatted and regulated; while more advanced writing has more variations and freedom. 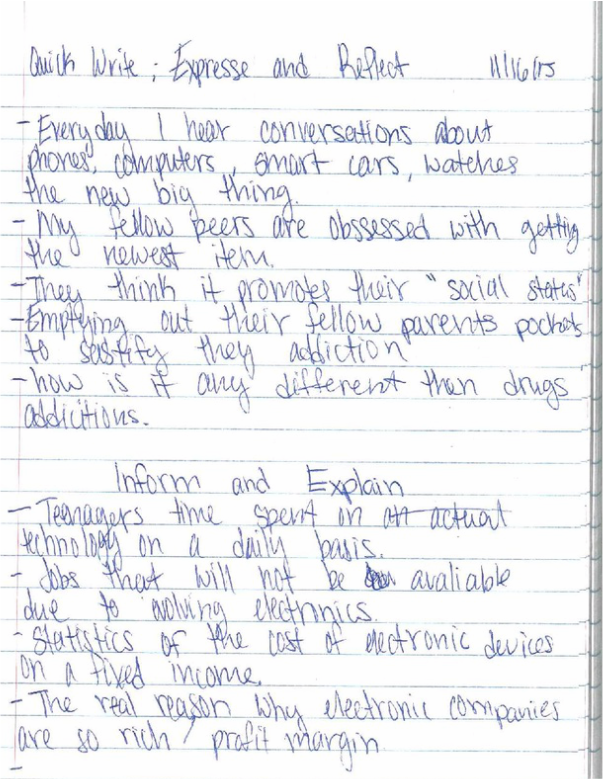 The document 'Real World Writing Purposes' gives six examples of different types of writing. The different types of writing is; express and reflect, inform and explain, evaluate and judge, inquire and explore, analyze and interpret, and take a stand/propose a solution. The express and reflect purpose was my favorite writing style, because I was able to validly give my opinion. This document purpose was to work as a brainstorm sheet; help get creative thoughts flowing. Filling out 1 topic= 18 topics was easy and helpful. It was easy for me to fill out since I was very passionate about the subject and had lots of ways to branch out. Being able to record all my ideas in an organized format helped me decide which writing purpose to choose too. Since I was so passionate about this piece I couldn't decide between express and reflect, evaluate and judge and analyze and interpret. So, my article is a mix between these three purposes. I am glad I mixed my article, because it allowed me to state my opinion, use personal experience and evaluate technology. These quick writes were done to get some practice trying to write with one of the formats. For five minutes we had to write about any idea that we could use for that specific writing purpose. This assignment promoted creative thinking, and it help me pick what to write about. Through these journal prompts I was able to decided that I wanted to talk about my generations addiction, our change in our work ethic and the invasion in our privacy. The Down Draft link above is the 2nd draft I wrote for my piece; the 1st draft was hand written in blue pen. As I read my down draft I noticed I had a lot of raw material and it was very broad. I only had a introduction and three body paragraph; it just looked liked a refine brainstorm. I noticed I was very negative and it sounded like a rant, but it was how I felt. When I wrote my 1st draft with pen and paper it really brought back memories and enriched my piece. It reminded me of what writing is all about; I didn't include this experience until the next draft though. * Our Fears, Our Guns and Our Children by Leonardo Pitt Jr.
* All Can Be Lost; The Risk of Putting Our Knowledge in the Hand of Machines by Nicholas Carr. From rereading all my mentor texts I noticed it influenced my writing. For example, I added a short bit about a colt and it's mother to show the resemblance in our own lives. The most helpful graphic organizers were the; Mentor Text 'Tribute Sheet', Sensory Image and Model Critique. Through these three graphic organizer I was able to use vivid writing, organize my thoughts and reference my mentor texts. For the Model Critique I picked a mentor text that I strongly disagreed with, but I enjoyed the way he brought in the reader. The Sensory Image organizer really help me go into detail about specific events, and helped me make my conclusion paragraph. The least helpful graphic organizer for me was the; Opening Lines. This one was just confusing for me and I don't think it helped my writing. A way to improve this is having more directions or explanations. The most helpful critiques were; the No-critique critique, Author-Led critique. These critique were done by my fellow peers reading through my work and leaving comments. This method of critique does require a certain amount of trust in your fellow classmates, but it is the only way to get physical critique. The most helpful feedback I got was a question; "What is your point for writing this?" My classmate Jose asked me this and all I could do was stare at him with a blank face. I realized there is no point in bashing technology it isn't going away, but I can help people remember. This one question helped me so much on my writing piece, and made me realize that I need to know the answer before I start to wright. The least helpful exercise was the scissors critique, because my partner didn't have anything but a modified brainstorm. So we both ended up focusing on his piece, rather then dividing the time equally. To improve this, maybe divide people into groups instead of random. So after many writing and critique sessions I was finally able to complete a final draft. I put a lot energy and emotion into my piece and I am very proud of that. When I first heard about this project I knew exactly what I wanted to write about. My favorite lines are my first and last, my first line is; "I see technology sprouting up like weeds infesting a garden". My last line is; "I can help people remember to remember." I feel like these two sentences really bring out how I feel throughout my writing process. Something that I would add into my next piece that I didn't in this one, is to add more statistics and studies. I feel if I had more scientific data then I could of gotten my point across better. The point of this project is to write about something you care about. The Friday before this project was announced my class had a Socratic Seminar about self driven cars, and that made me realize how integrated technology is in our society. I feel very passionate about this and I was glad I was able to write about this. When I was writing my piece I started off very passionate and headstrong about how horrible technology was, but I realized I was being very ignorant. I was ignoring both sides; the good and the bad. After reading countless mentor text I realized my one article can not change the world, but I can help people remember. My final draft is a little more subtle than my first draft, because of all my critic sessions. From this writing process I learned the importance of cutting some of your favorite lines for the sake of your piece. It might be hard, but it might hurt your piece more than it helps. Something that I would change in my writing piece is bring out the message of remembering how it was before, and to remember to remember.